The infamous skyjacker D.B. Cooper case is making headlines once again. This year the FBI was notified about the discovery of nearly three dozen D.B. Cooper serial numbers from stolen banknotes. Now the FBI has a possible D.B. Cooper torn and tangled parachute that was found buried by children in southwest Washington. Cooper hijacked a Northwest Orient Airlines 727 flight from Portland to Seattle in 1971. 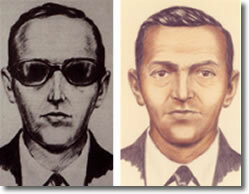 During the flight to Seattle, Cooper said he had a bomb and demanded $200,000 and parachutes. When the plane landed, he released the passengers in exchange for the money and ordered the pilot to Mexico. While in flight, he jumped from the rear stairway.